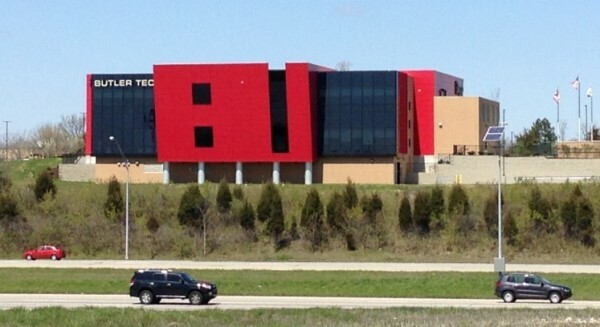 The new Bioscience Center serving 11th and 12th grade students is located in a state-of-the-art facility on the I-75 corridor in West Chester, Ohio. The facility is located in a “hotbed” of biomedical-related industry with additional land on the site for expansion of the Bioscience Center in the near future. Career technical students grow their 21st century skills through experiential learning, which prepares them for college and medical-related careers. The Bioscience Center programs include Health Technology, Dental Assisting, Exercise Science and Project Lead the Way Biomedical Science. The facility connects students with real world experiences, mentorship connections, clinical and internship opportunities, and encourages their commitment to the bioscience field. Cincinnati State’s supply chain programs cover the entire industry, including its forms of transportation, the software systems used to manage the flows of raw materials, parts and finished products, and the efficient use of warehouses and other storage systems. Specific types of training provided at the Supply Chain Career Development Center in West Chester will include: Courses and labs associated with the Supply Chain Management certificate program; Courses and labs associated with the Supply Chain Management associate degree program; Commercial Driver’s License classes (in partnership with Butler Tech); The American Production and Inventory Control Society’s Global Logistics Associate program; Forklift Essentials (OSHA compliant); MSSC Certified Logistics Associate (CLA); and Certified Logistics Technician (CLT) programs. Supply Chain Management Certificate and Degree Programs are both available along with other logistics-related training. Located in southwestern Ohio, Lakota is the 8th largest school district in the state, and the largest school district in Butler County. Lakota has grown in the last 20 years to a student population of over 17,000 proving to be one of the top quality public school districts in the state. Indiana Wesleyan University is an evangelical Christian comprehensive university that is committed to liberal arts and professional education. U.S. News & World Report ranks Indiana Wesleyan University as "one of the best Master's universities in the Midwest." Indiana Wesleyan University stands ready — with the resources and the passion — to equip future generations of learners with skills they will need to meet the challenges of our rapidly changing world. The West Chester Indiana Wesleyan University campus is the answer for busy adults wanting to finish their degree while juggling family, career, and other commitments. Miami University's Voice of America Learning Center offers undergraduate courses and programs, graduate courses and programs in education and business, and customized training opportunities for business, industry, school districts, and government agencies. Xavier University's MBA program at West Chester offers the same benefits of the on campus program while allowing students to complete their degrees in 22 months. The Hondros College Nursing Education program is perfect for those just getting started in the nursing field or LPNs who are ready to take their career to the next level.